Pain is one of the most common reasons Americans seek medical treatment. Back pain is the leading complaint, with an estimated 26 million Americans between the ages of 20-64 visiting their doctor each year due to frequent back pain. At Chicagoland Pain Management Institute in Bolingbrook and Hinsdale, Illinois, we understand how pain can interrupt your daily schedule and interfere with work and family relationships. Our pain specialists work with you one-on-one to educate you about your pain management options and create a customized treatment plan to relieve your pain and help you regain your quality of life. Pain management specialists are fellowship-trained physicians who provide a wide range of treatment options, including medical management, interventional and surgical techniques, pain psychology, and therapy, for patients suffering from chronic pain. At Chicagoland Pain Management Institute, our physicians are trained to treat a variety of painful conditions utilizing a comprehensive and multimodal approach. Learn more about the types of pain we commonly treat in the pages below. Pain is your body's natural response to actual or potential damage. When you feel pain, your body is protecting you—even when it might feel like it isn't. We feel pain when special nerve endings called pain receptors cause electrical signals to be sent to the brain through the spinal cord, which the brain recognizes as pain. Pain may be categorized as either acute or chronic, depending upon how long it has lasted, and may be classified as mild, moderate, or severe. What’s the difference between acute pain and chronic pain? Acute pain occurs immediately after an injury and lasts no longer than two months with proper treatment. Pain is considered chronic when it lasts six months or longer. 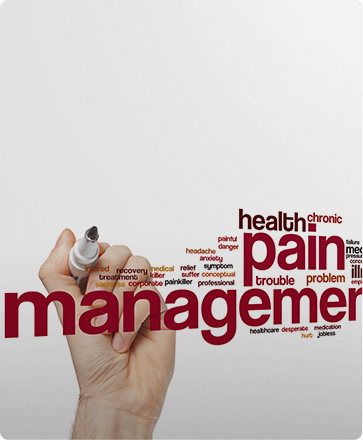 Why should I see a pain management specialist? Pain can be very difficult to manage, because pain affects everyone differently, and treatments vary from patient to patient. Your pain management physician has a wide range of treatment options available to treat varying levels of pain. Treatment plans usually begin with less invasive therapies and progress to more aggressive solutions if necessary, depending on the type and severity of your pain. Pain can also be difficult to diagnose. There are three types of pain (nociceptive, neuropathic, and mixed, as described below) and each responds to different treatments and therapies. After describing the features and expectations of each treatment option, your pain management specialist will work with you to develop the best treatment plan for you, adjusting as necessary along the way, based on the nature of your injury or condition, the level of your pain, and how you respond to various treatment options. What are the three types of pain? When describing pain, the types will fall into three categories: nociceptive pain, neuropathic pain, and mixed pain. Depending on the type of pain you are experiencing, your pain specialist will be able to create an appropriate treatment plan for relieving your pain and restoring your normal lifestyle. Neuropathic pain (nerve pain) is a result of structural damage and/or dysfunction within the nervous system. Since neuropathic pain often presents in widespread dysfunction throughout the body, the initial cause of the pain is often difficult to track. An example of neuropathic pain is reflex sympathetic dystrophy (RSD), or complex regional pain syndrome (CRPS). In some conditions, pain appears to be caused by a mix of nociceptive and neuropathic factors. An initial nervous system dysfunction or injury may trigger the release of inflammatory mediators, resulting in a subsequent neuropathic inflammation, causing the quality of pain to change to a burning, throbbing or tingling type of pain. Examples of mixed pain include migraine headaches and myofascial pain. Pain can have a negative effect on both your health and state of mind, but the right pain management treatments can get you moving and active again, leading to a happier, healthier life. To schedule your consultation, call Chicagoland Pain Management Institute in Bolingbrook, IL at (630) 312-4505 or in Hinsdale, IL at (630) 856-6825 or use our convenient online appointment request form.